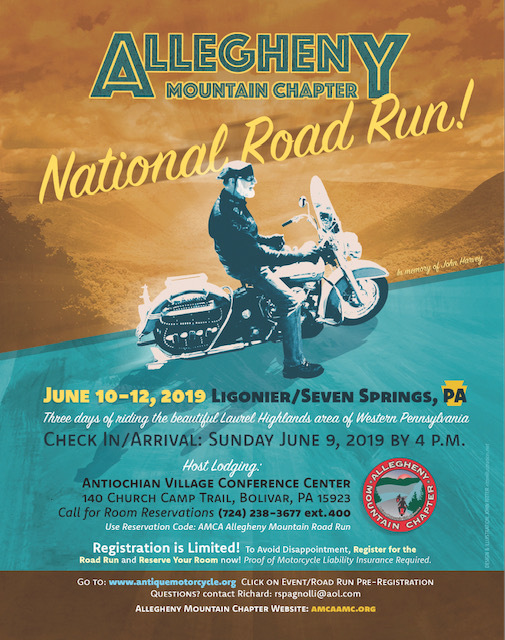 Thank you for your interest in our Chapter sponsored AMCA National Road Run June 10-12, 2019 at Ligonier/Seven Springs, PA. The link to the Road Run illustrates some of the areas and sites we will visit on the three days of riding. Our host hotel, Antiochian Village, is a self-contained facility where both Welcoming and Farewell banquets will be held as well as a full breakfast every morning for participants. Bon fires are planned for each evening. And the usual stories around the campfire, the unique camaraderie that only a National Road Run can bring and of course, maybe a brew or two. Camping is available for those interested a few miles from the host hotel. We are planning for three catered lunches to avoid crowding the few local restaurants along the roads we will be riding. For the two nights on your own for dinner (Monday and Tuesday), there are many fine restaurants in Ligonier which is located just six miles from Antiochian. We are also planning a bike show around the Diamond Square in Ligonier on Monday night with entertainment and a chance for local folks to come and view our old bikes. We will be riding the beautiful Laurel Highlands area of Western Pennsylvania. There are many historic sites to visit along the way. And just plain fun of riding your old motorcycles on roads that you will think you “own” because of the limited traffic in a rural setting. Please join us. We promise you won’t be disappointed. Because space in the host hotel is limited as well as the number of Road Run registrations, we are encouraging all who are interested to register now for the Road Run online at antiquemotorcycle.org and also reserve a room at the host hotel, Antiochian Village. Please note that if you reserve a room at the host hotel, you will be required to register for the Road Run soon thereafter. We want to avoid the host hotel rooms being reserved without those folks registering for the Road Run. We hope you understand the reason for this requirement. NOTE: As of January 3, 2019, all of the rooms allocated at Antiochian Village have been reserved. There will be a wait list if cancellations occur. We encourage everyone now to reserve a room at our overflow hotel Ramada Inn in Ligonier. Please click on the Ramada icon above under hotels. The Ramada is on the way for each day’s ride. All members staying at the Ramada are invited to participate each night in the bonfire at Antiochian (5 miles). Registration on Sunday June 9 until 4 PM will be at Antiochian regardless of where you are staying.